Disclaimer: I am not employed by nor have I received any inducements from Wulflund to prepare this review. I write solely as a paying customer. 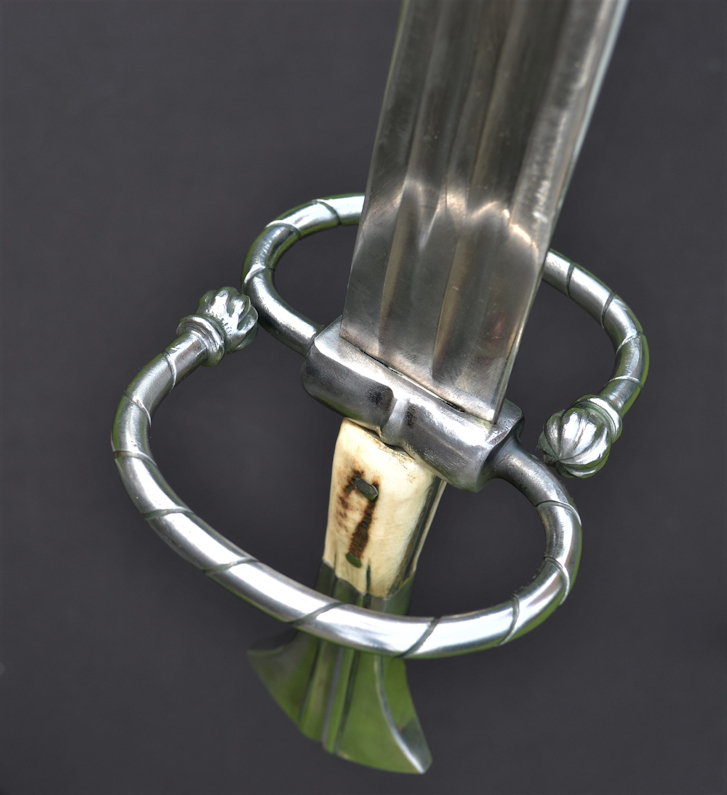 I had been interested in obtaining a copy of this iconic style of sword for some time. I did a few web and forum searches and came across the Wulflund site. They seemed to have some nice products and mentions of them online were generally favourable. 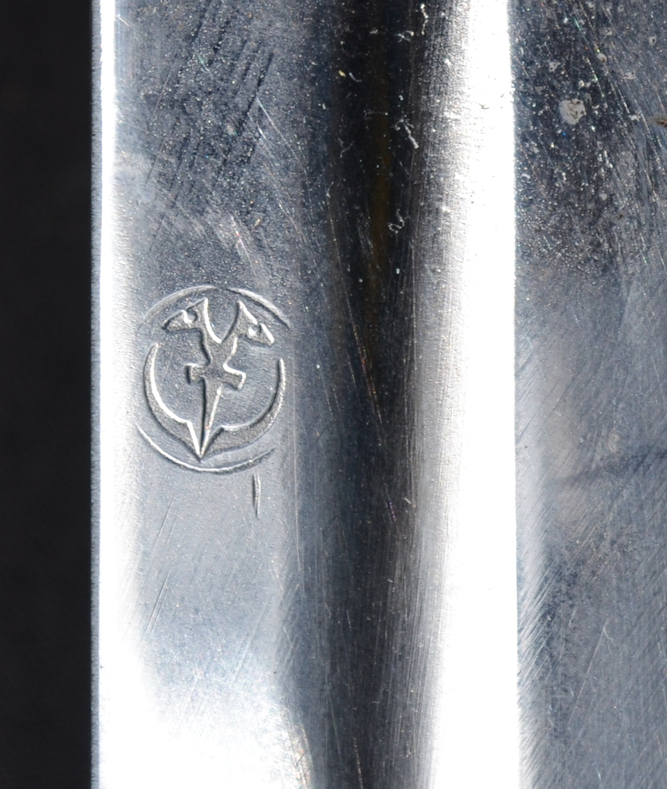 They seem to act as agents / retailers for a number of Czech smiths but the swords are all branded with the Wulflund logo. Ordering was simple but one slight problem was getting a sharp sword. Several swords on the site came with an option to buy as a sharp for a small fee. The example I chose did not have this option listed. I did request sharpening but the sword arrived with re-enactment edges. To be fair I was not charged a sharpening fee and I think this was a simple miscommunication. After the order was placed I was contacted by email asking if I had any preferences for scabbard design. I sent a couple of pictures of fairly basic leather scabbards. The only particular feature I wanted was the unique style of chape that Katzbalgers seem to have. I did not specify leather or metal as both seem to have existed historically. Katzbalger with an antler handle. Material: high carbon spring steel CSN 14 260, hardness approx. 50 - 52 HRC. Sword mark: Wulflund. Overall length: 80 cm, length of the blade: 65 cm, width of a guard 13 cm, width of the blade at the guard: 4,5 cm, point of balance approx 11 cm below the guard, weight: 1,48 kg. 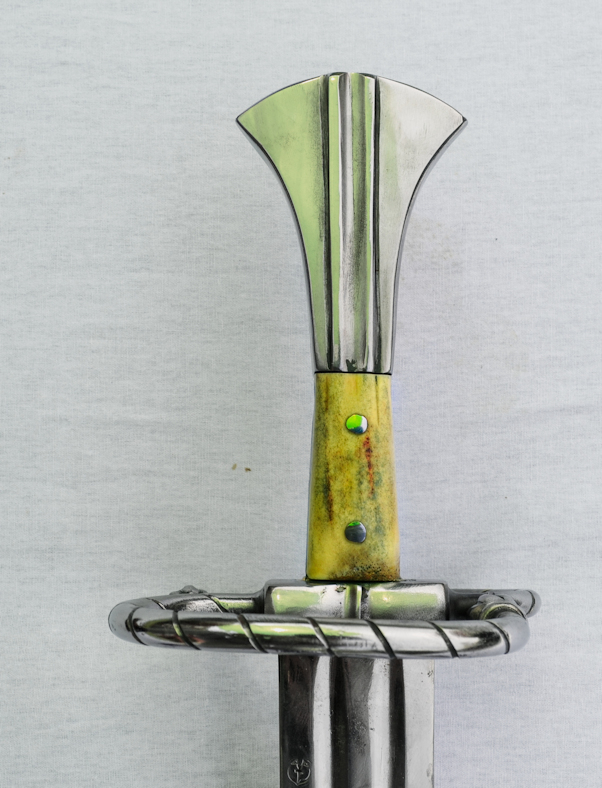 Katzbalger sword, signature side-arm of the Swiss and German Landsknecht. Antler insert to grip. S or figure of 8 guard. Purchased blunt, has now been sharpened. Wulflund trade stamp on ricasso. POB: 4'' (10cm) from crossguard. Profile taper: 1.78'' (45.4 mm) at ricasso, 1.59'' (40.5mm) at mid blade, 1.34'' (34.1mm) 2 inches from tip. Distal taper: 0.16'' (3.9.mm) at ricasso and no discernable taper for the rest of the blade. The sword feels solidly constructed. The horn inserts riveted through what looks to be a full-width tang. I say looks to be as it is difficult to tell if it is the tang sides that are visible or if it is an extension to the large pommel that the scales are riveted to. 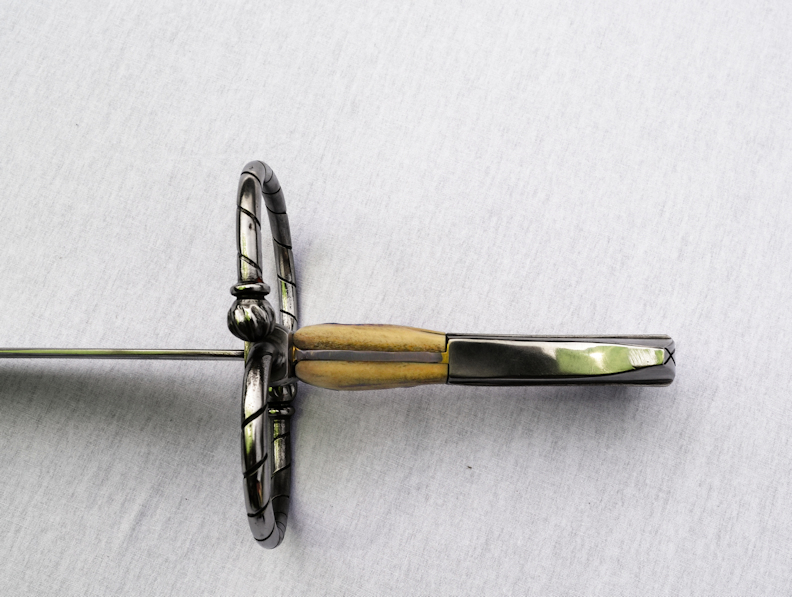 There is a large and solid peen to the end of the pommel. The S shaped (figure of 8 style ) guard is robust but nicely detailed. There is a slight asymetry to the guard almost like an italic S. A few tool and scuff marks to the blade and guard, nothing that detracts but I think just adds to the appeal as a proper hand made sword. The pommel is flared in one plane. 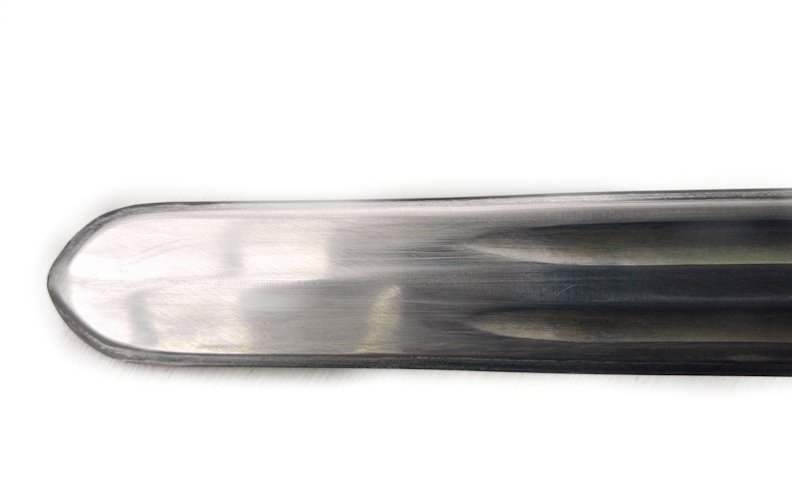 The blade has twin fullers terminating 3 inches from the tip when the blade assumes a flattened broad diamond section. There is slight, constant, profile taper ending in a rounded tip. The blade seems well tempered and hardened and took a fair bit of work to obtain a decent edge. I think this is weighted at the top end of historical examples. As such I would describe it as a heavyweight chopper. No distal taper which I think it would benefit from but reasonably balanced for a sword used primarily for cutting and chopping. Little thrusting ability. Difficult for me to say as I have not had the good fortune to handle any historical examples. General appearance seems good. Katzbalgers displayed a fair amount of variation but the flared pommel, S guard and broad, twin fullered, round tipped blade all seem to be fairly common, if not signature, traits. 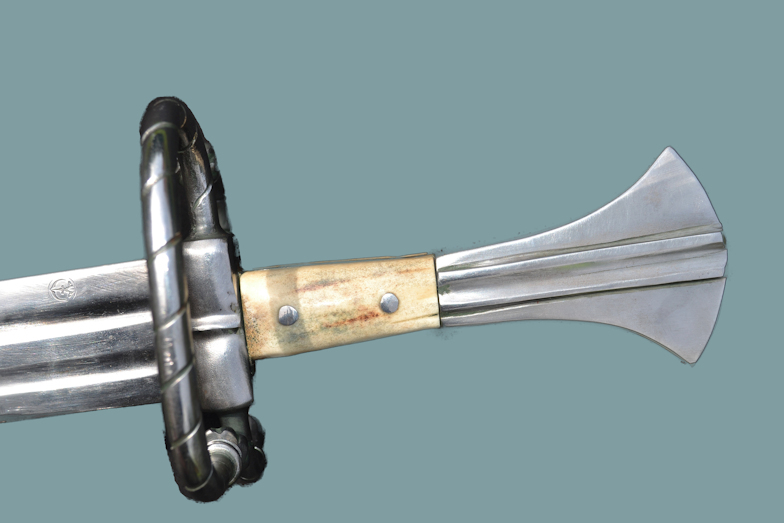 As with many modern swords, I would say the handle is perhaps a little too long but it does allow for the off hand to grab the pommel to give more leverage. Very pleased with the sword. Well built, in a unique style. Needs a good bit of wrist strength to wield effectivly but the point of balance is reasonable.The scabbard is rather plain and utilitarian, (but not particularly cheap) but I hadn't asked for anything fancy. 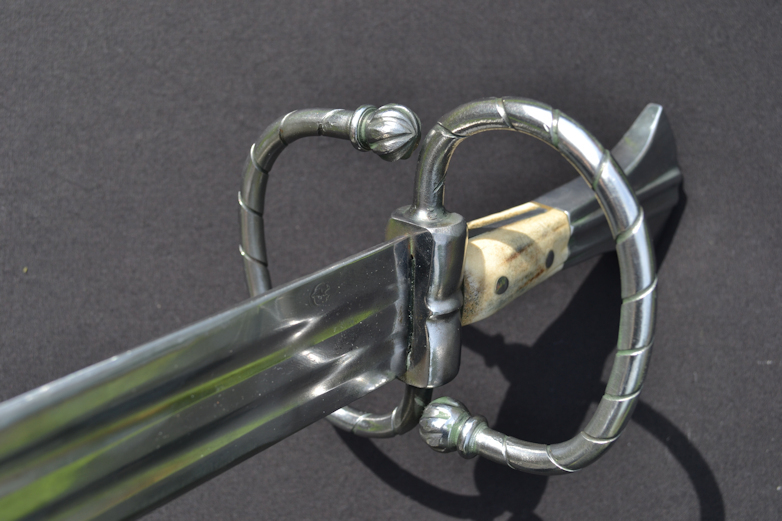 A nice example of a Renaissance arming sword of iconic style. Pretty nice review. This one listed as made by Wulflund. I have an iron age sword from them and it is nicely made, but has no distal taper and was made by "Wulflund". Strong and stout, but very heavy and a pain to control. It was moderately sharp, but still needed some help to cut much of anything. Did you find the minimal language barrier to be an issue? I have also had some minor miscommunications on other purchases. Did you find the minimal language barrier to be an issue? . Thanks. Language not really a problem but there again I did not have that much of a conversation. I pretty much just left them to get on with it as it was a stock item with no customisation.